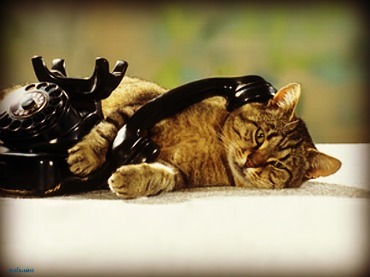 One of the residents of the city of Veliky Novgorod in northwestern Russia has caught her cat in recurring acts of telephone hooliganism, after which the insidious animal’s activities were terminated. The truth about how the cat, named Clasha, was amusing itself, came out only after an angry call from the city’s telephone service, Ria Novosti news agency says. The operators told the stunned cat’s owner that somebody living in their apartment “had been dialing the number of the local emergency gas leak service and staying silent”, and added they were not going to tolerate “those telephone games” any more. As the woman had no reason to doubt the service workers’ words, she asked herself a question – who was inside the apartment at the moment of “crime”. And it appeared that only the cat had been. The suspicion that Clasha could press telephone buttons with a paw soon confirmed, as the woman actually caught the animal in the very act of the crime. Following the incident, the apartment dwellers decided to put the telephone beyond the reach of Clasha’s paws. The cat though, switched over to another type of hooliganism, gnashing the unapproachable telephone cables instead. The dwellers withdrew both the telephone and the cables. It’s obvious that the cat has the next move.